So I published two new books over the weekend (four if you count the paperback versions), and I wrote remarkable copy for each of the book pages. And after 24 to 72 hours (more like four), the pages were live to be lost in the abyss of the Amazon system. I was happy. I got me a drink and let the knowledge that books I’ve worked off and on for 4 years were finally out in the netherworld. I checked out the ‘Look inside’ feature of the Kindle of my short story collection, Dissonic Voices. Son of a … the ten percent of the book contains the whole first story. On the one hand, that’s great. They’ll meet Amanda, fall in love with the horror of her, and want to read more. On the other hand, I just gave away a free story. And it doesn’t say that she appears later in another story. The first story is just a teaser. The paper version stops seven pages in. So, I decided to write a blog post. Tell whomever reads this, Amanda is a cute little waif of a demon. Actually, she isn’t a demon. She is… well, the second story later in the book explains it. 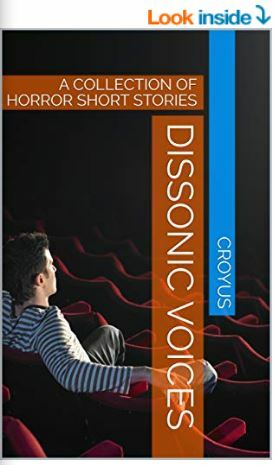 I’d recommend getting Dissonic Voices cause it the best set of horror short stories I’ve ever written!